EZ View Solar Powered Illuminated House Number is visible at night from more than 100' away. Turns on and off automatically. Numbers are approximately 2.75" high x 1.5" wide. Why should your house number be visible from the street? EZ View® helps emergency medical services, police, and firefighters find your house quickly when you call for help at night . . . and when every second counts. Having a clearly visible illuminated address number can cut emergency response time drastically. Solar powered house number charges all day and glows all night. Turns on and off automatically. Attaches to any surface (e.g., brick, stucco, siding, shingles, concrete, wood). Units can also be attached to your mailbox, tree, or fence (mounting screws included). Ultra bright red LED house number is designed and built for maintenance free operation and durability. Injection-molded PVC is UV coated to withstand the elements. Each EZ View unit contains a high-quality Siemens-made solar panel that charges the internal power cell. 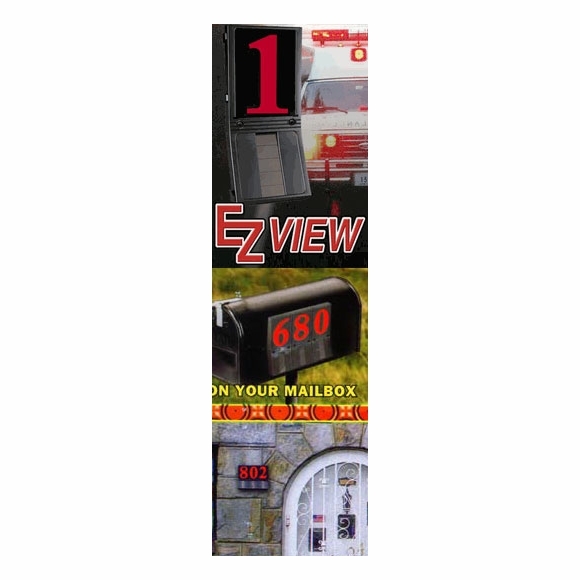 Please purchase as many EZ View units as necessary to form your house number. Each EZ View package contains a full set of numbers (0-9) and a hyphen/dash (see inset above). Units are made to snap together. 2-year mfg. warranty. IMPORTANT Your order quantity should be as many EZ View units as necessary to form your house number. For example, if your address is 321 Main Street, you need to order quantity 3. If your address is 54902 Tulip Lane, you need to order quantity 5.